The road can be a wild and dangerous place. As a driver, you have speeding cars, police and rescue vehicles, pedestrians, cyclists and slow-moving tractors to watch out for. However, motorcycle riders are perhaps one of the biggest concerns. Not only are they as vulnerable to injury as cyclists, but they often travel very fast, sometimes even faster than the cars on the road. A collision between a driver and motorcycle rider could potentially be a very horrific event, and for this reason, it’s important to keep a watchful eye out for motorcycles. It’s a good idea to double check just about everything you do, let alone the things you do on the road. Double checking your blind spots before merging lanes could save someone’s life. The combination of motorcycles being small and fast makes it easy for one of them to sneak up behind you in a nearby lane. If you look behind you and see one that appears to be far away, always err on the side of caution. It could be traveling much faster than it appears to be. You probably already know that you’re supposed to leave a cushion of space between you and the driver in front of you in case of sudden stops. Extend this space when following behind a motorcycle. Chances are, rear ending a motorcycle is going to result in a far more tragic outcome than rear ending a car. You should always leave enough room to stop in case the motorcycle driver loses control in front of you. After you gain some experience driving, you will see that your eyes tend to become trained to look for certain things. For example, you will find yourself immediately braking as soon as you see the brake lights appearing in front of you. This is a good instinct to develop, but be aware that both cars and motorcycles can slow down without actually braking. Motorcycles often rapidly slow after downshifting, so always keep alert and watch your following distance carefully. Blasting rock music in your car may be tempting, but it’s a good idea to keep the music at a volume that allows you to hear noises outside of the car. Motorcycles are often much louder than cars, which can help you hear them coming. It’s especially important to listen while driving on hilly or curving roads, as you could hear a motorcycle coming long before you would see them. This rule applies to both cars and motorcycles. If you see a turn signal while coming up behind someone in a lane, don’t assume that they will move out of the way in time. Sometimes people have their turn signal on by mistake, and this is especially common with motorcycle drivers as most motorcycle signals don’t automatically turn themselves off. View a turn signal as an indicator of a coming action but never count on it. 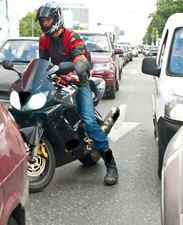 Statistics show that over 30 percent of all collisions between motorcycles and cars occur at intersections. Avoid an accident by carefully checking for oncoming motorcycles when crossing traffic to make a left turn. Taking that extra second to double check doesn’t seem like much of a nuisance when compared to making a mistake that could end a life.